Last Friday our electricity went out. It wasn’t out long, thanks to an incredible effort by the electric company, but it really made me appreciate how attached I am to the grid. No lights, no AC, not even fans, but the worst of all, no refrigeration. The lack of refrigeration had me in a slight panic, since I have 3 very full refrigerators. As I type that number, it sounds completely ridiculous. Now I feel compelled to justify them…one is for the family, one for my dough buckets (I’m testing recipes for a new book) and the other is a beer fridge that houses more butter, than beer. Once we realized there was no storm damage to our house, it was kind of romantic to be in the dark. Our home was built in 1902 and I imagine there were many, if not most, nights spent in the glow of candlelight back then. For one night there were no computers, no TV, not even the radio, which is my constant companion, just quiet. The next morning my husband and I walked for 3 hours around our neighborhood with our jaws dropped. The storm, which was being called a “rain event” by the weather types, didn’t seem that violent, but there were trees down all over town and most of the city was without power. Our neighbors, who just moved into their house, had a 60-foot tree laying in their driveway. Thank goodness it missed the house, but it was mind bending to see it stretched out in their yard. 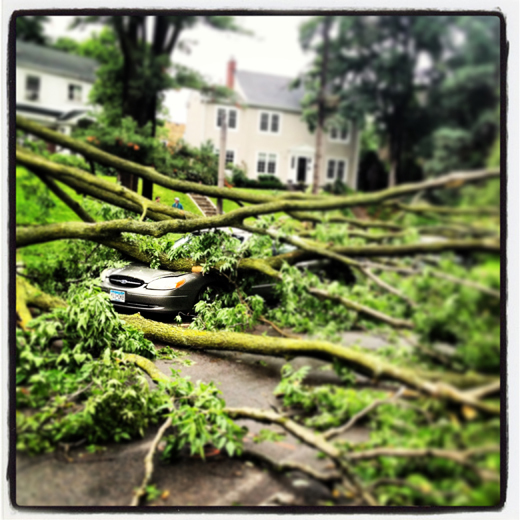 That rain event left cars crushed, roofs damaged, basements flooded and roads closed. A week later the city has power again and life, for most of us, is back to normal, but it still takes my breath away to drive through my neighborhood and see all of the old trees knocked to the ground. Nature is quite something. During the storm a friend and fellow MN food blogger, Shaina of Food For My Family, tweeted that she was going to empty her powerless refrigerator and have a giant BBQ. The grill was to be the salvation for all those meat filled freezers. As some of you know, I rarely have anything but carbs in my house, so I wasn’t in fear of losing lots of grill-ables. Instead the grill was my saving grace when there was no electricity to crank my oven on, because I could still bake. Grill baking. Even when there is no storm, it is my oven of choice in the summer, so as not to heat up my house. I’ve baked everything on the grill from bread, buns, pita, pizza, fruit crisps, galettes and this week corn bread and peaches. This is a sweet corn bread, almost a cake, which is perfectly suited for breakfast or dessert, but could certainly match up with a rich, savory meat you’ve just grilled up. 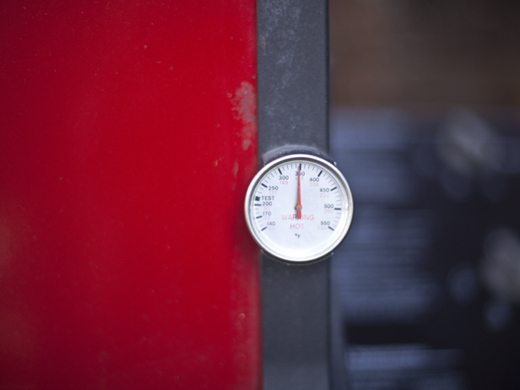 Preheat the grill to 350°F (for my gas grill this means all burners on low to get an even heat) If you are using charcoal, you will want to light them, then let them cool off slightly to achieve an even, low heat. 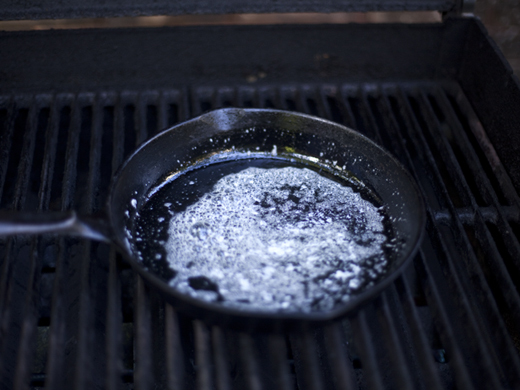 Once the grill is to temperature, place a 9-inch cast iron skillet in the grill to preheat. 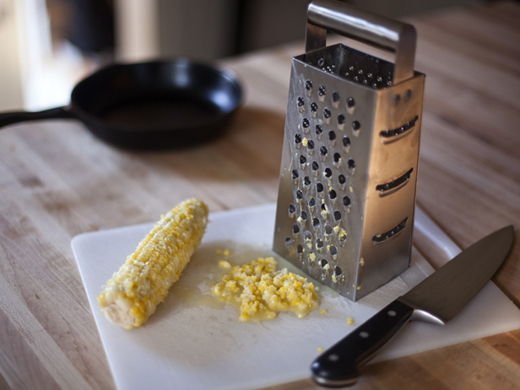 Grate the corn and keep as much of the liquid as you can. In a large bowl, whisk together the cornmeal, flour, sugar, baking powder, salt, and baking soda. In a small bowl combine the buttermilk, egg yolk, corn and oil. Add the wet to the dry and stir to combine. 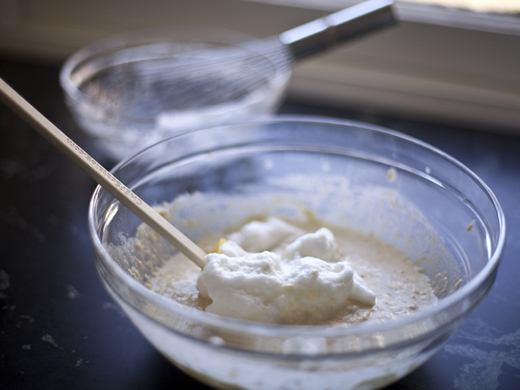 In a clean bowl, whisk the egg white until stiff peaks. Gently fold the egg white into the batter. Add two tablespoons of butter to the pan, shut the lid for a minute and let the butter melt, but not color. Pour the corn bread batter into the hot pan. Shut the lid of the grill and bake for about 18 to 25 minutes, depending on your grill. 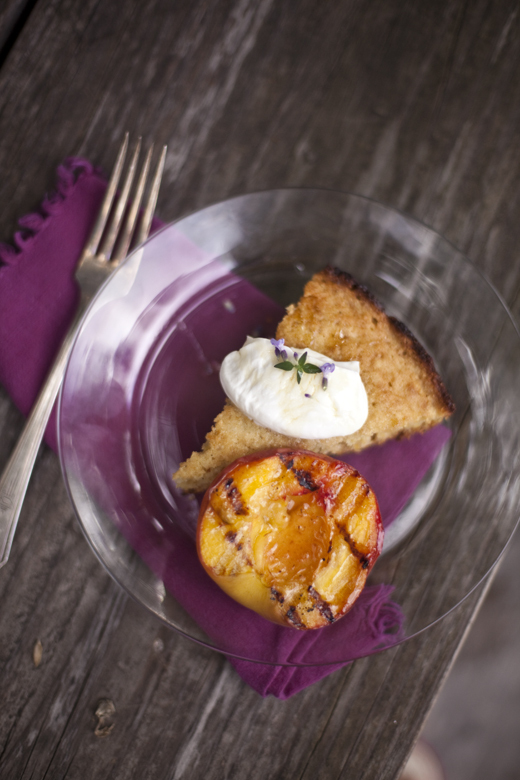 Remove the corn bread from the grill while you prepare the peaches. Brush oil on the cut side of the peach and lay them cut side down on the grates. 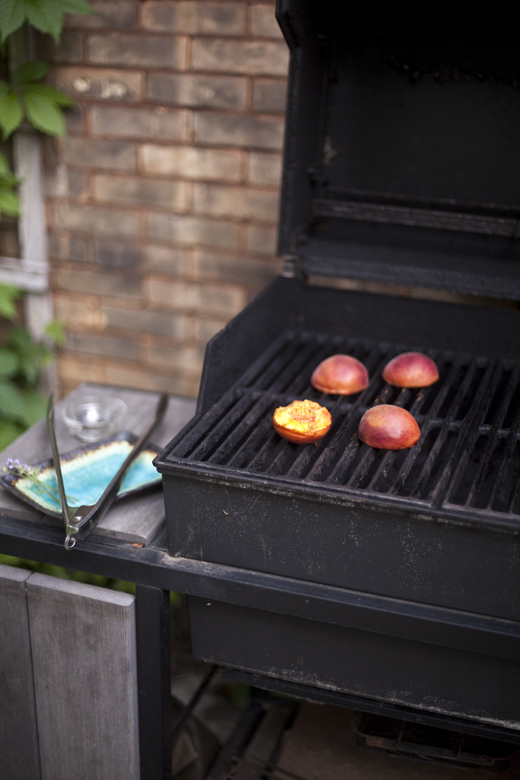 – If you want a smokey flavor to your peaches, you can add some soaked apple or cherry wood chips to the grill. If you don’t have a smoker, then just put the chips in a foil packet with holes in it and place it directly on the heating element below the peaches. 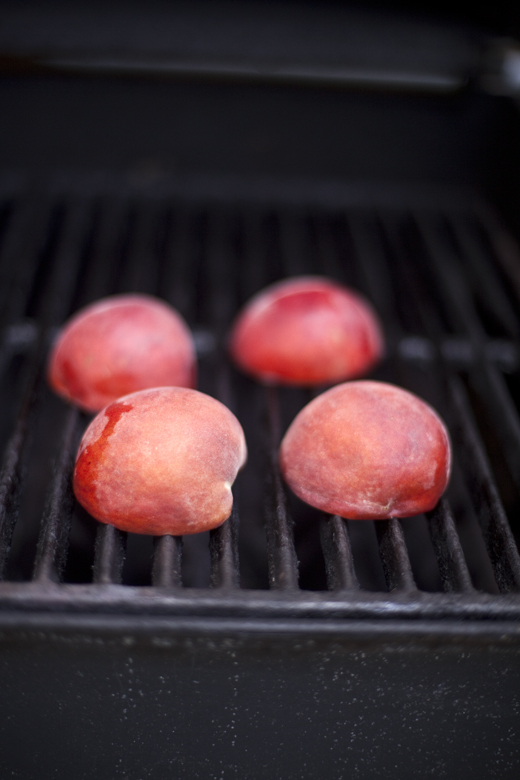 After about 10 minutes, turn the fruit over and continue grilling for another 5 minutes. Cut the corn bread in wedges. 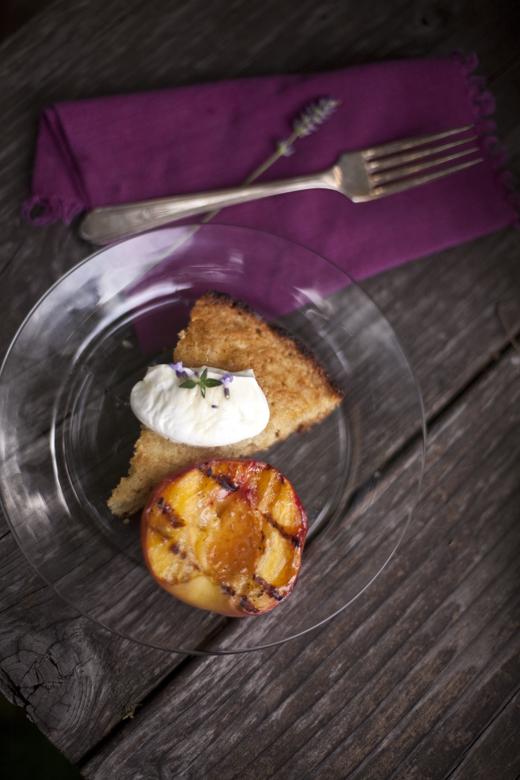 Serve with the peaches, a dollop of yogurt, a drizzle of honey, some fresh lavender, and thyme leaves. 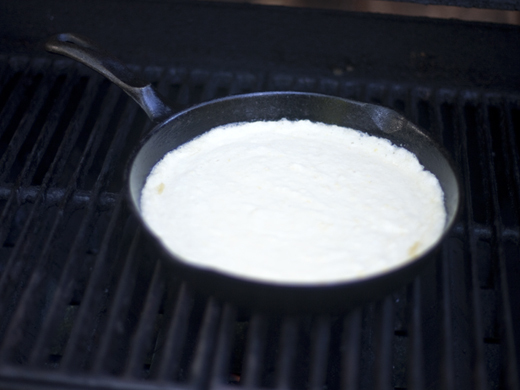 It makes a brilliant breakfast while camping or a side dish to a grilled pork loin. I recently got to meet Dara Moskowitz Grumdahl, an award winning food writer and restaurant critic based in Minneapolis. It was a thrill to chat with her during the “Off the Menu” radio show on WCCO. Gorgeous, so good to know I can bake on the grill! I’m glad to hear that you’re ok when it sounded so serious! You’ve definitely made the best of a bad situation with this recipe. I’m so glad to hear you and yours are safe and sound after that massive storm. We came home from vacation to an apartment without power, which was great because we didn’t have anything in the fridge but also terrible because we didn’t have anything in the fridge. 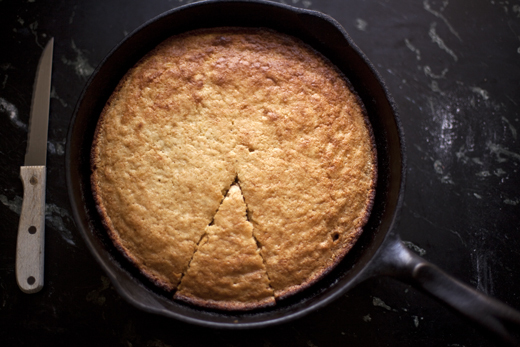 🙂 This cornbread looks and sounds amazing — hoping to try it at least once this summer (preferably without a power outage involved ;))! omg! that tree damages are so awful. thank god no one is injured. 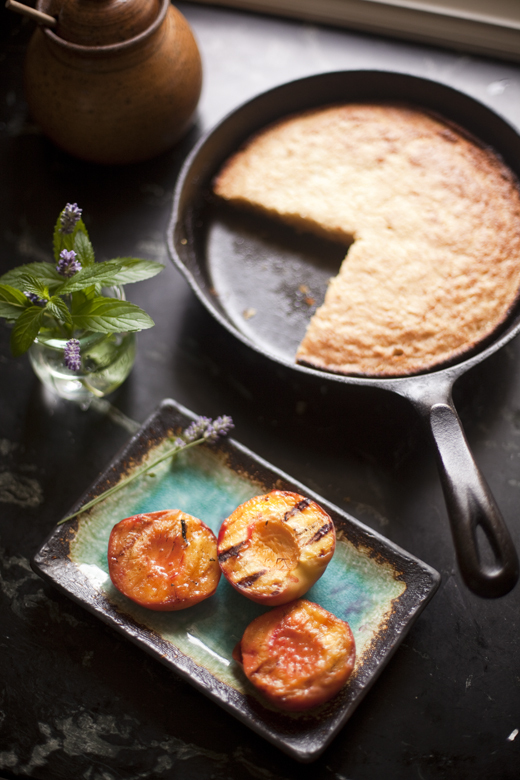 that cornbread with grilled peaches looks amazing! know what you mean. our power was out 3 days….how creative you are with the grille. I love this. 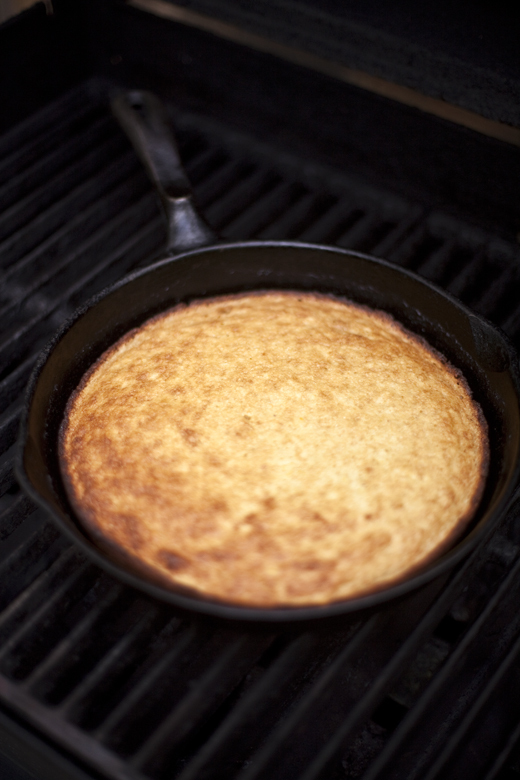 A great variation on my cornbread in the iron skillet recipe. Can’t wait to try it. wondering if Whole Foods still has the apricots? Thank you Zoe! My friends look at me like I’ve lost it when I tell them what I make on my grill; but why not? It’s to hot to turn on the oven and I enjoy some crazy forays with the grill; the pineapple upside down cake being the most difficult but nothing beats peaches if you ask me. This looks fantastic…worth losing power for I say! Glad you’re safe; sure looks like it was bad. I love baking on the grill, even if people think we’re mad for it! 😉 I’ve grilled pineapple, but will have to try making an upside-down cake. You know, that photo of the storm damage is stunningly beautiful and it took me a minute to actually see the crushed car! Wow! Growing up in a hurricane zone, I feel your pain. But I also think stormy nights without electricity is somehow romantic. And the idea of cooking all of the food on a grill very cool and nostalgic. I know…weird, right? I think I have just lived through so many bad hurricanes that I just look at it all like this. I want to try the cornbread and peaches… and was just thinking about grilled peaches so thank you for the instructions. It was freaky in the how quickly and quietly it came. The rain softened the earth and the trees just seemed to tip. Unsettling! The peaches are delicious and I made the leftovers into a milkshake with fresh lavender. YUM. So happy to have discovered your website. Tonight I tried to grill perfectly ripe nectarines and could not cut them in half because the pits would not release from the fruit. Can you tell me how to separate the halves? That is a great question. Some stone fruits are called “freestone” and the pits come out very easily, others are called “clingstone” and as you experienced, they cling like crazy and have to be cut away from the fruit. There are special knives that are rounded like spoon for doing this, but I generally just use a paring knife to get the job done. With some practice, the fruit remains in tact. The peaches in the post were clingstone and they didn’t suffer much from my cutting the stone free. just this morning, I was wondering what I could do with these peaches! this looks delicious!